The "Via Dolorosa" means the "way of sorrows" or it is sometimes called the "way of the cross." It refers to a pilgrim route that begins near the Lion’s Gate where some believe that Jesus appeared before Pontius Pilate and was tortured by the Romans. It ends at the Church of the Holy Sepulcher (site of crucifixion and resurrection of Jesus). 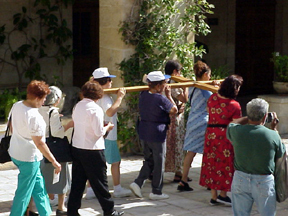 On Fridays, especially on Good Friday, Christian pilgrims process through the streets of the Old City of Jerusalem, carrying a cross, stopping to pray at the fourteen "stations of the cross" where it is thought that significant events associated with the passion of Jesus occurred. Some of the logic for such piety can be traced back to the 14th century A.D. But the origin of the current route and its fourteen stations only goes back to the 19th century! Although the piety and devotion of the pilgrims are evident, there is unfortunately no historical evidence that Jesus followed this route. Indeed, a Roman Catholic scholar used to lead "a protest procession" on Good Friday from the site of Herod’s Palace near Jaffa Gate — where he thought (probably correctly) that Jesus had appeared before Pilate — to the Church of the Holy Sepulcher.